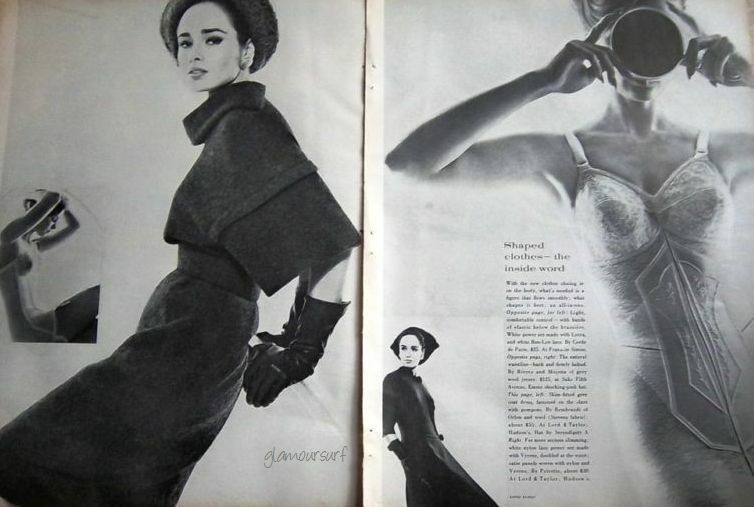 It's 1963, and check out the undergarments that women wore. The bullet style bra and that high waist long line pantie girdle. These were the correct foundations to wear with 60's fashion to keep you in the shape you want but also to provide the silhouette that 1960s fashions needed. This ad is for the Promise Bra and Promise High Waist by Poirette. "Millions of women trust the power of a Promise-High -Waist to slim away inches, smooth away figure imperfections. Now they can complement it with the ideal bra, new Promise Bra with gentle Biaband control. This exclusive feature within each cup makes the most of a small boson, minimizes and contours the full bosom. The next time you select your personal wardrobe, put two Promises together. They add up to the most elegant figure you've ever had. That's a Promise." The Piorette Promise was trademarked in 1951, but has since expired. The "Promise" term did start being used in the 50's Here's another ad from 1952. So Poirette successfully used the promise trademark for quite a number of years and eventually abandoned it. But, it really does help to wear the proper foundation garments under your vintage fashions, promise. Marilyn Makes Any Outfit Look Fabulous!